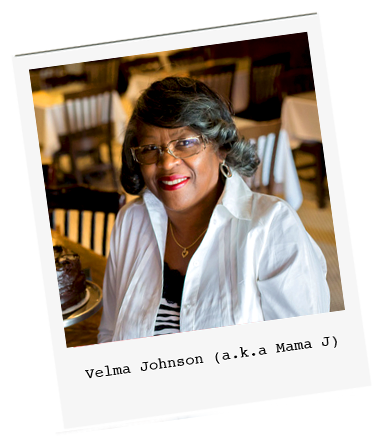 The story of Mama J’s begins during the childhood of Velma Johnson (affectionately known as Mama J), who was born one of fourteen children to Willard and Alease Roland. In their cozy home on the West End of Richmond, Velma and her siblings took part in all of the household chores, including helping their mother and grandmother in the kitchen as they prepared large family meals. This is where she learned the magic of the recipes that are now served at Mama J’s. Fast-forward 50 years later: Velma’s eldest son, Lester Johnson along with his best friend, Jonathan Mayo, saw an opportunity to help facilitate the redevelopment of Historic Jackson Ward — Richmond’s historically African-American neighborhood that once was the epicenter of black commerce, entertainment, and religion in the South. Together, they knew his family’s recipes were just the way to help stir up revitalization in the district. 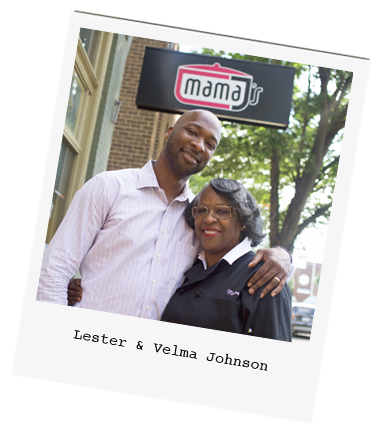 In 2009, the family opened Mama J’s (a name give to Velma by her daughter-in-laws), and its reputation has risen to one of the most notable soul food restaurants in America. Over the years, Mama J’s has catered to thousands of soul food aficionados while earning rave reviews from local and international food critics alike. Food so good doesn’t come without its accolades. Most recently Thrillist.com listed Mama J’s as one of “50 Restaurants to Try Before You Die”. Richmond Magazine praises it as one of “25 Best Restaurants in Richmond”, and Style Weekly has ranked Mama J’s as Richmond’s “Best Soul Food Restaurant” three consecutive years in a row. Velma Johnson — a local celebrity in her own right — has been recognized as an award-winning chef and often makes appearances on WTVR’s (Channel 6) cooking segments. 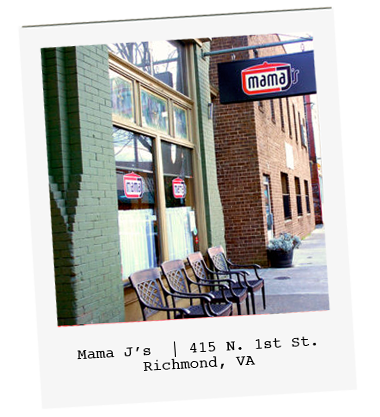 Mama J’s has been featured by ESPN, National Geographic, Southern Living and a host of local networks. Today, Mama J’s attracts a varied clientele, including its loyal regular patrons, renown food critics and tourists alike. The restaurant has also become “the” place for celebrity-spotting, from pro-athletes to grammy-award winning artists and elected officials. Patrons enjoy the restaurant’s extensive menu of a la carte traditional dishes, like mouthwatering fried chicken, succulent fried catfish, savory blue crab cakes and a host of complementary sides dishes like macaroni & cheese, candied yams, and collard greens. Whether you live in Richmond or just stopping through on your travels, you’ll always find freshly prepared food at Mama J’s and the warmest atmosphere to fellowship with friends and family. Come experience it for yourself and be sure to let Mama J know how her food tastes. Throughout her life, Velma Johnson has been an exemplary supporter of numerous charities and causes that help those less fortunate. 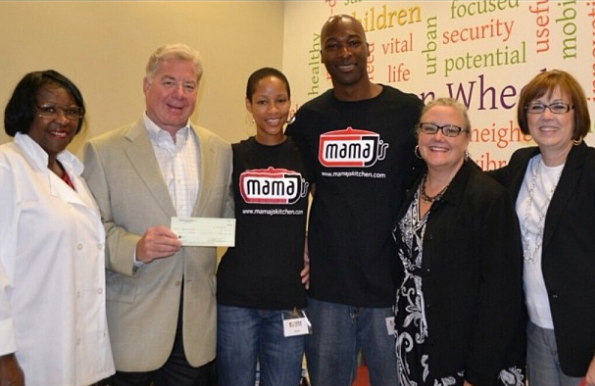 In sharing her success, Mama J’s partners with organizations that work on the front lines to support health and education initiatives, including FeedMore, the United Network for Organ Sharing (UNOS), and the Ronald McDonald House Charities® of Richmond. Mama J’s spirit of giving on a local level is a way for the Johnson family to continue the legacy of good works so effectively initiated by Willard and Alease Roland. In previous years they have unselfishly fed the homeless who convene in Monroe Park, provided Thanksgiving meals on behalf of the Churchill Senior Citizens Association, and donated school supplies to Central Virginia Salvation Army and the Boys and Girls Club of Metro Richmond.